Sometimes, a restaurant comes along and really takes my breath away. Okay, not really my breath per say, cause then I wouldn’t be able to breath let alone write. But it takes me by surprise. And I’m not going to bore you with more neighborhood nonsense, because you already know how I feel about restaurants in Midtown compared to restaurants, well, anywhere else. But this is a tale of a terrific restaurant in midtown. Vitae is like a needle in a haystack, like one shiny star in a dark night sky, like one fabulous pair of shoes in a sea of ugly shoes. Why such high praise for the midtown eatery? Because it freakin rocks, that’s why. The restaurant features contemporary American cuisine in a space that feels so American retro and yet so chic. So so chic. I love it when you walk into a restaurant and feel important, and that’s exactly how I felt walking into Vitae. And no, I don’t think anyone let them know in advance the Bite-Sized Blonde was coming in. From the moment I sat down, to the agonizing moment I left, I was treated like the most important customer in the restaurant. And let me reiterate, they don’t know about the power of my pen. The service at Vitae was some of the best I have experienced in, well, let’s just call it a long time. The waiters know their stuff, down to every last ingredient in a dish and even how the food is prepared. This is the service that other restaurants should strive to have. To be honest, I might have even liked the restaurant if the food was mediocre. Especially since I did happen to eat there a few short weeks after it opened. But alas, the food was f*^&ing awesome. No, seriously, it was divine. I can usually maneuver around a bread basket. Now, don’t get it twisted, I love me some bread. But I also know my priorities, and they are often deterred by that menacing bread basket. Well, the bread basket got me at Vitae. Probably because it wasn’t a basket; it was served in a cast iron dish. The bread looked like four supple pillows of doughy heaven. It had a natural, and quite dazzling sheen if I do say so myself, and was then dusted in large flakes of sea salt. I don’t care who you are, there is no denying the power of bread perfuming the air, especially when it looks like this. Unfortunately for both me and you, I started with something that is no longer on the menu. A poached egg, garnished with mushrooms, frissee, chips and chives and served alongside golden toast points. In three words, I can describe this dish…come to mama. 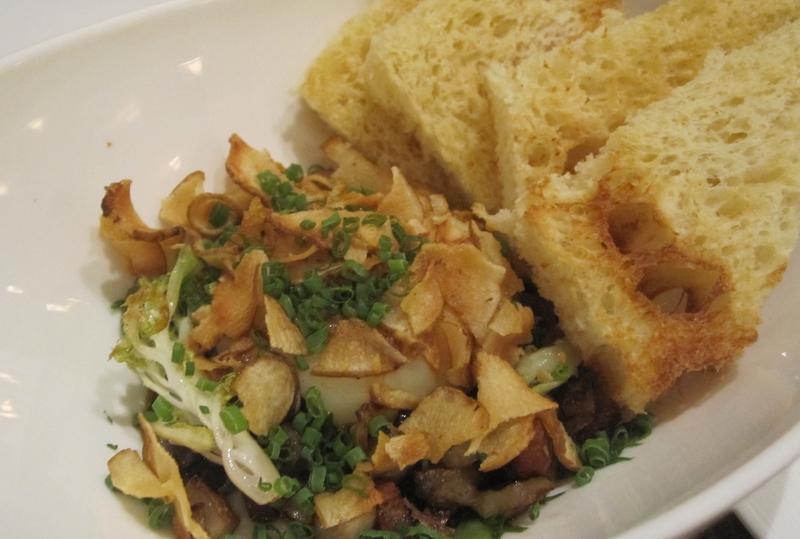 The mushrooms brought an element of earthiness to this rich dish, and the chips were such an unexpected pop of crunch. Breakfast, lunch, dinner, you name it, I’d eat it. I also ordered the Pulled Pork Tacos. 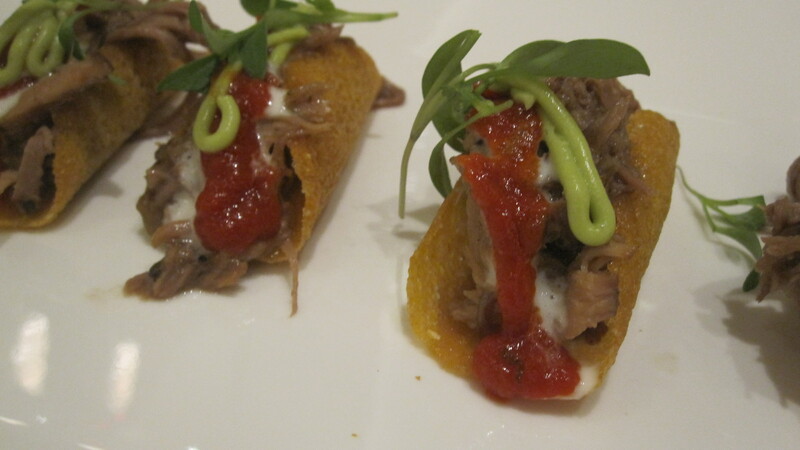 The miniature shells were made of polenta – so they were sweet and crunchy and the ultimate vehicle for buttery soft pork. Each bite was better than the last. Had it not been for the rest of the food on the way, I might have told the waiter to keep ‘em coming. I have an outrageous love for beets which I can only attribute to too many hours of watching Doug Funny. 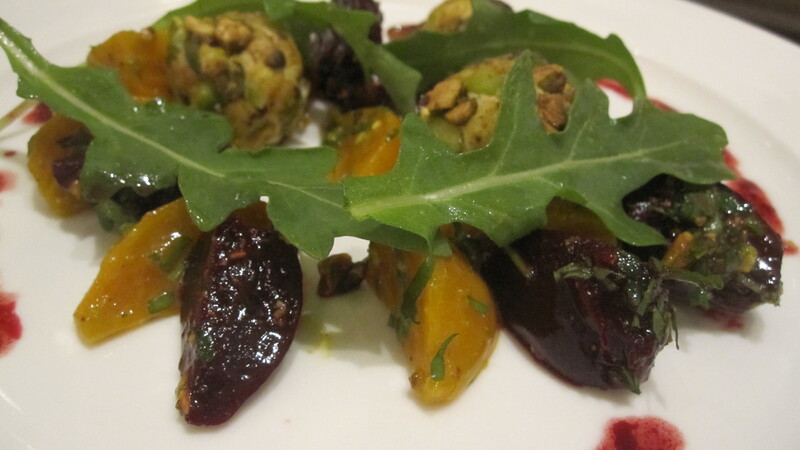 So, I couldn’t pass up the Roasted Beet Salad. It was served with Asian Pears and pistachio covered goat cheese. This was good, but so much of the menu is a stand out, I would forgo the beets for something a little more, dare I say, original. 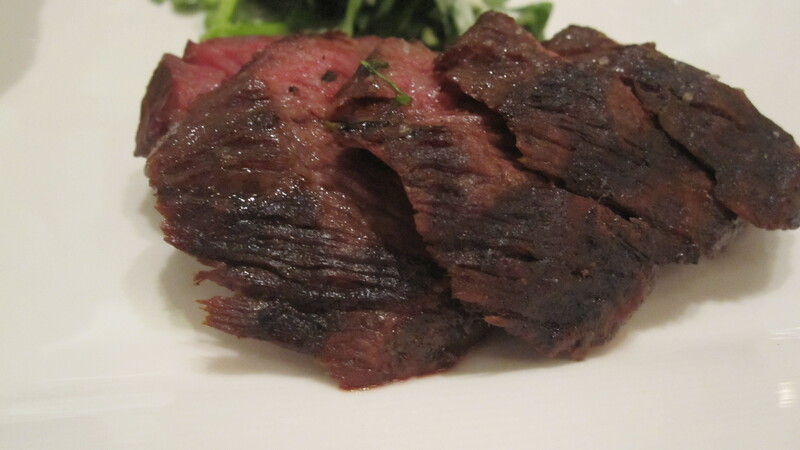 Hanger steak is one of my favorite cuts of meat because it is so flavorful. 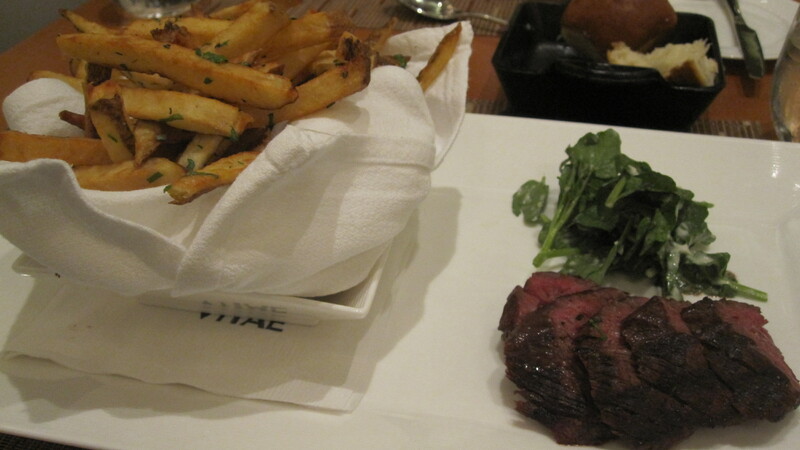 And the hanger steak at Vitae was just that. It was charred and then sliced to display its soft pink center and served alongside a watercress salad and a mound of salty French fries. Damn, that’s one fineee piece of meat. And we all know you cannot eat a steak without a side dish, and no that does not include the French fries. 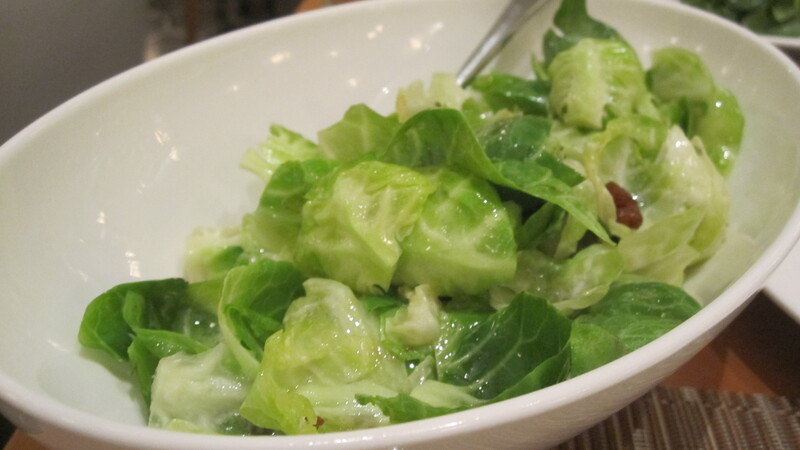 So, I ordered the Brussels Sprouts & Bacon and boy did it hit the spot. This dish was a pleasant surprise from start to finish. The leaves of the sprouts were removed and left whole, then blanched and tossed in bits of bacon and lots of bacon grease. Sounds indulgent, but it was light as can be. It was reminiscent of a salad – if salad tasted like bacon. And last, but certainly not least, we finished with a soufflé that must have been made in heaven because it was godlike. Served in a tall mug with a shot of freshly whipped cream, this dish was everything I needed and more. 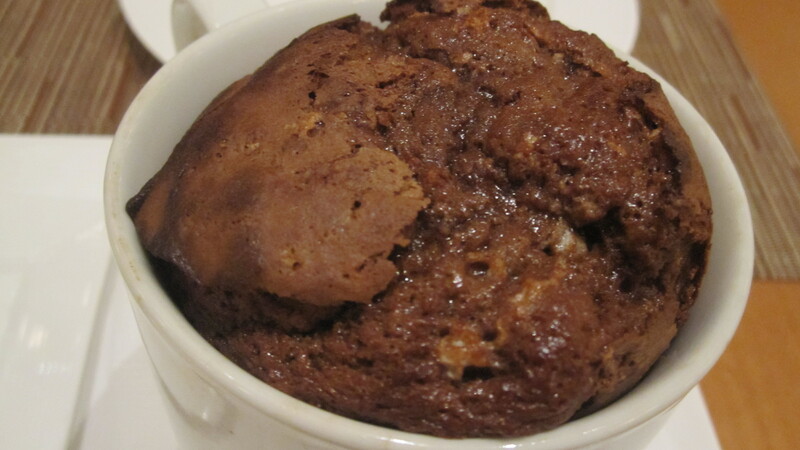 Chocolate can be such a heavy dessert, especially in the middle of the day, but soufflé by nature, is the exact opposite. I told myself I was only going to eat one bite, and then the next thing I remember is trying to lick the mug. Sorry Mom. This entry was posted in Restaurant and tagged American, Client Dinner, Dinner, Impressive, Lunch, Midtown. Bookmark the permalink. thank you BSB Fan and Eating Partner! Wow what a review! You can definitely judge a restaurant by its bread and this looks amazing as does the rest of the meal. I pass by this place almost daily on my coffee break and will need to check it out ASAP. Thanks again for a great read. Now my stomach is rumbling. Thanks for the great comment Michael! You definitely have to check this place out!